What a busy week! 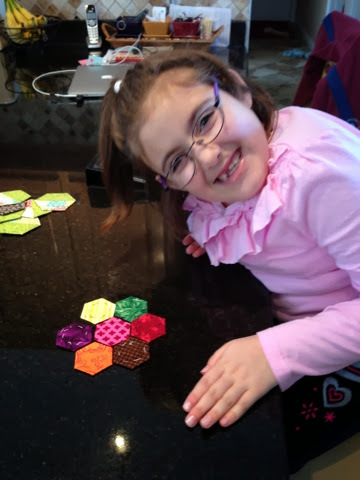 I took some time with my granddaughter, Gracie, to teach her basting hexagons. 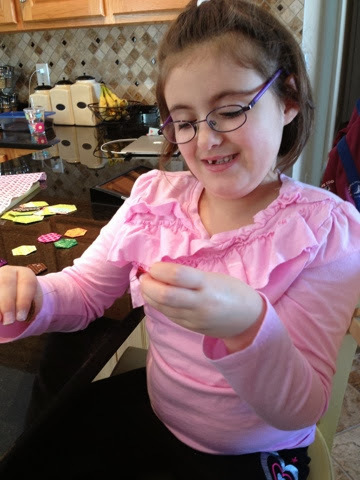 Gracie was born at 31 weeks, has a form of autism, and struggles with her small motor skills. 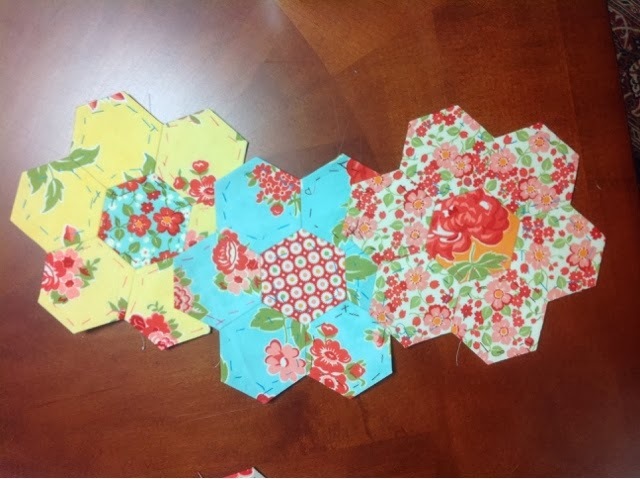 She actually used the needle :) without my help, and stayed focused long enough to complete 7 - 1" hexies. And look at how proud she was when she finished! She chose all of her own colors and this is the very first time she basted all by herself. I am so proud of her! And so now for my progress. I was able to add one more section and completed 3 more flowers. And thank you to everyone who provided suggestions for thimbles! It was very helpful and I ordered several to try. I will write a separate post next week with the results. You are all wonderful! 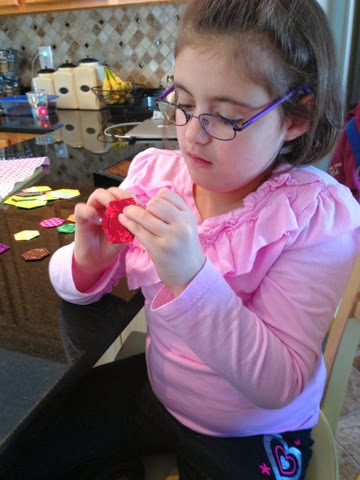 I am linking up with Jessica at Life Under Quilts! Check it out and join the fun! Great job Gracie! Your progress is pretty too. Thanks Pamela! It is coming along :) and I get anxious each week to see how much I can get done! Thanks Michelle! She is loving it, but she can't wait until she gets the hang of the needle and stops poking herself :). 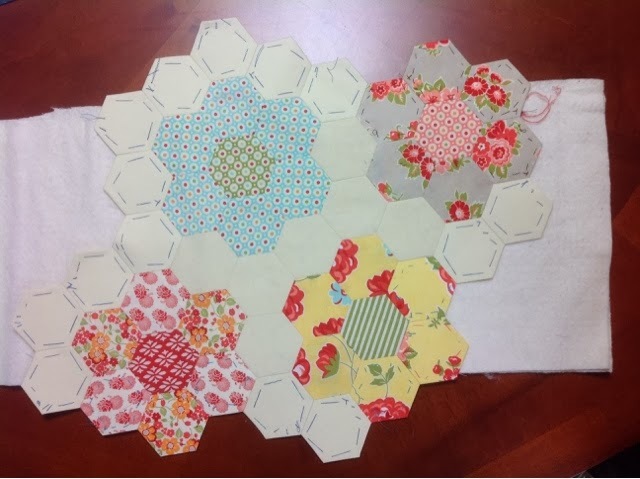 She told me tonight that she wants to make the hexies into a blanket for her dolls. I think this is a great idea because it will be small enough for her to finish everything by hand. I hope she does remember. I have very fond memories of my Grandmother showing me how her treadle machine worked. I have that old machine and every time I see it, I smile. I was only 12 when she passed away, but I think of her so often. She was one of those people who could just look at something and figure out how to make it. I hope my granddaughter has as many fond memories!